BUFFALO – Sabres rookie Casey Mittelstadt’s first NHL point wasn’t created by his dynamic speed, adroit passing or supreme hockey sense. No, 4:51 in the third period of Thursday’s 6-3 loss to the hapless Detroit Red Wings, Mittelstadt, 19, simply won a draw cleanly back to linemate Evan Rodrigues, who beat goalie Jimmy Howard to get the Sabres within one goal. One game, one assist for the eighth overall pick in 2017. The crowd inside KeyBank Center, which cheered Mittelstadt throughout his NHL debut, roared when the center’s assist was announced. Years from now, Mittelstadt will remember everything – the anticipation, the first time his skates touched the ice – about his first outing. The rest of the Sabres, however, want to forget about Thursday’s ugly loss, their seventh in nine games (2-6-1). 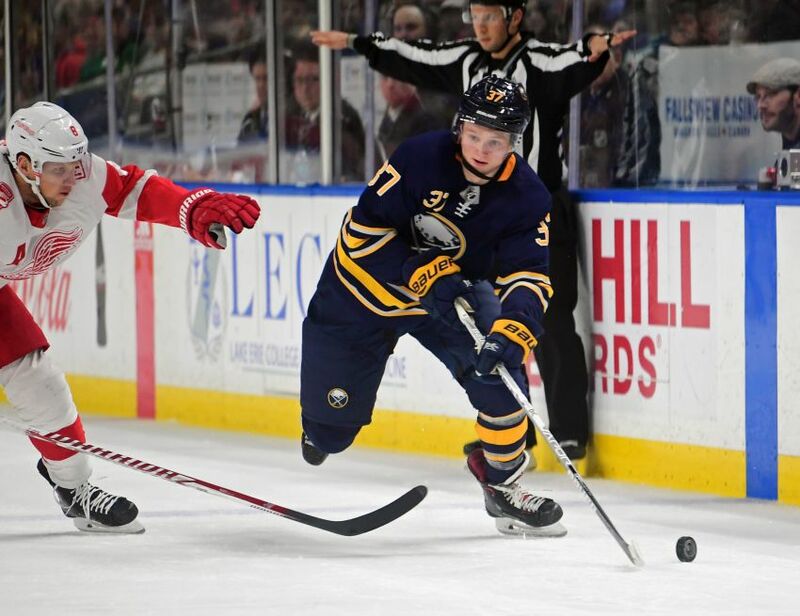 Against the reeling Red Wings, the Sabres opened up an early 2-0 lead, putting a team that had won just two of its previous 15 games on the ropes. Center Jack Eichel scored at 3:16. Center Ryan O’Reilly followed on the power play at 7:11. But instead of burying a team that had lost 11 straight road games (0-10-1), the Sabres imploded before the 18,493 fans. After center Dylan Larkin narrowed it to 2-1 later in the first period, the Sabres missed two short-handed breakaways. Then Darren Helm’s short-handed breakaway goal tied it 5:21 into the second period. The Red Wings rattled off four straight goals before Rodrigues scored. “It just seemed like we never really had our game going again after that,” said Eichel, whose 25th goal set a new career high. “There were spurts of it, there were some good things. But consistently, shift in and shift out, I thought it wasn’t really where we wanted it to be. Every play matters. Every pass, every shot, everything. It all goes into winning hockey. Incredibly, with one game left here this season, the Sabres won just 11 times at home. Meanwhile, Mittelstadt, who left the University of Minnesota earlier this week, skated 12 minutes, 53 seconds Thursday, including 80 seconds on the power play. His teammates had some early fun when they sent him out for a solo skate to start the pregame warm-up. The American registered one shot on goal, was on for two goals against and was also whistled for a faceoff violation in his first game since March 3. Sabres goalie Robin Lehner left with an undisclosed injury following the second period and was replaced by Chad Johnson. Housley had no update on Lehner, who was banged up last week and missed some time. Update: The Sabres recalled goalie Adam Wilcox this morning. Lehner, according to the team’s injury report, is day-to-day with a lower-body injury. Goalie Linus Ullmark, meanwhile, has a concussion. Ullmark was injured Monday morning.